Possums and Opossums belong to the group of mammals known as marsupials. Marsupials, like other mammals, are covered with hair and give live birth although they do not have long gestation periods. Marsupials a significant group of land mammals in South America and Australia while there is only one naturally occurring marsupial in North America, the opossum. In fact the Australian possum got its name because of a remote resemblance to the American opossum! The American possum are actually called opossums, of the scientific order Didelphimorphia and the Didelphidae family, with at least 103 differing species. The term possum correctly refers to the Australian animals of the suborder Phalangeriformes of the order Diprotodontia. Opossums are found only in North America, although there is a “water possum”, also known as the yapok, which is found in Central and South America. Possums on the other hand are native to Australia, but not New Zealand, New Guinea, Indonesia and some small islands in the Pacific. The brush-tailed possum found its way to New Zealand over a hundred years ago. Didelphimorphs or opossums are small to medium-sized marsupials, with size variations in the approximate range of a small mouse to a large cat. Most opossums have long snouts, a narrow skull a pronounced sagittal crest. They also have a large number of teeth with small incisors, large canines and tricuspid molars. Many opossums dwell in trees, at least partially and are omnivores. Didelphimorphs walk with their feet flat and their hind feet have an opposable claw-less digit. The North American opossum has a bare prehensile tail unlike the Australian possums which have furry tails. Possums are four-footed marsupials with prominent median incisors and long thick tails. The smallest possum, colloquially known as the Tasmanian Pygmy Possum has a body length of less than 3 inches and weighs about 10 grams. The largest, the Bear Cuscus, can weigh more than 7 kg. Possums are mostly nocturnal and generally herbivores or omnivores. The opossum has a dark gray coat, although some diverge to yellow-brown tones, while the possum is primarily gray in colour. Anomalous white opossums have also been seen. Opossums have demonstrated partial or total immunity to many sorts of snake venoms. They have the capacity to digest a huge variety of food but also eat the skeletons of rodents since they need high levels of calcium. While not as cute as cats, they kill cockroaches and rats in their own territory. With the halux or opposable toe on the hind feet, opossums are the only mammals other than primates with a thumb-like faculty. They also have conscious control over their prehensile tail which they are able to use as a fifth hand. Possums have a number of predators in the wild, including foxes, cats, birds of prey, Tasmanian devils, dogs, dingoes and snakes. They are solitary animals and rarely group together except to mate. 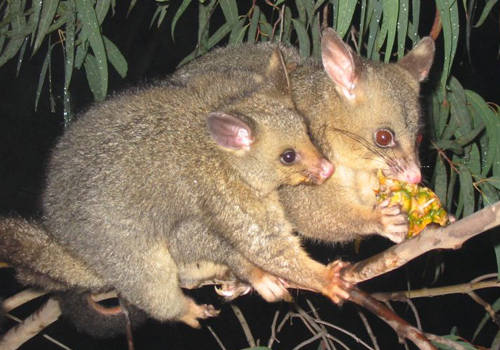 A female possum gives birth to up to four baby possums after a short gestation period of approximately a fortnight after which the babies move to the mother’s pouch until they are able to start feeding themselves. Usually only one possum child survives the six months or so that it takes them to become capable of independent survival. Given that the possum and the opossum refer to a number of different varieties of marsupials, the easiest way to delineate the differences between them is to describe one of each type. The Australian Common Brushtail Possum is unique to New Zealand and Australia while the Virginia North American Opossum is native to the eastern United States but has spread through to western United States and Central America. The Brushtail Possum is one of the largest types of possums and can grow to up to three feet in length. The Virginia Opossum is grows to about a foot and a half, roughly between 15 and 20 inches. The Possum is brown, auburn or grey with a mushroom colored undercoat, and furry face and prehensile tail. The Opossum has a silver grey to grey black coat with a white pointed face, pink nose and feet and a bald prehensile tail. The Possum’s fur is medium length and plush while the Opossum’s is coarse with long flat hairs. The Possum has a life span of roughly 6 years while the Opossum lives somewhere between 2 and 4 years. The Possum got its name from its distant marsupial cousins, the Opossum when Sir Joseph Banks mistakenly assumed that they belonged to the same immediate family. The two animals have only as much as common as all marsupials and the dubious distinction of being thought pests by human beings. de. "Difference between opossum and possum." DifferenceBetween.net. May 10, 2018 < http://www.differencebetween.net/science/nature/animals-nature/difference-between-opossum-and-possum/ >.